Are you the owner of a yellow Reliant Robin? Does your business resemble a modern day Trotters Independent Traders – T.I.T? 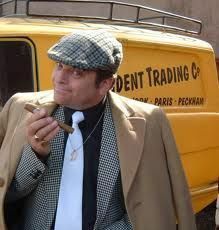 Are you ‘Del Boy’ in disguise? Will we see you down the market pushing out some clobber from ‘a mush in Shepherds Bush’? I’ve just had a great call with a former colleague who told me stories of conversations he’s had with marketers in the UK over recent days about their view of social channels. Channels to market! Of course, if you’re under pressure to deliver your numbers each week, the temptation to push, push, push more and more through these channels is understandable. But the bigger picture is this: your preparedness to engage, to listen and respond above anything else, IS your marketing message. It’s what you will be known for. Indeed, very soon, your reluctance to listen and engage will be what you’re known for. And that will be the end of the line. Or Peckham! We talked about brands with a mystique and their reticence to actually talk to people for fear the myth would be shattered. Again I understand this, but your customers are human beings. They know that there are other human beings behind the mask. Deciding on the voice and tone for your brand is one of the earliest decisions that needs to be taken. That’s why the Best Buy view of allowing thousands of ‘Blue Shirts’ to tweet isn’t appropriate for everyone. There is no manual! But not engaging is the road to ruin. Don’t be a ‘plonker’ all your lives….